Hey guys. First time posting on this forum. My name is Jacob and I was one of four drivers for Love Racing (Blue 1.6L 1990 Miata, #647). The other drivers are Charles (our Stig), Nick and Tommy Love (brothers). And of course I have to give a SO to the MVP of the team, Daddy Love. Without him there is no way we could run the pits as efficiently as we do. This was our second Champcar race ever. In fact it was our second real race ever. Our first was Road Atlanta in February. In Atlanta I think we did 16th in class and like 48th o'all (don't quote me). We finished the race without contact and the only major issue was a spent accessory belt. Well, WE FINISHED OUR FIRST 24! No contact, no major issues (exhaust fell off at about 3 am but we found a solution quickly) and I am very proud to say we placed 7th in class and 27th o'all. We managed sub 4 minute fuel/driver change stops when we didn't have to fix something. I am absolutely blown away with how lucky we are. Let me also say that was some of the most exhausting, terrifying, intense, and exhilarating driving I've ever done. In just one of my night stints I had about five near misses and quite the off in T18. I was also on the rear bumper of the black/white Miata for about 30 minutes in the 10pm-12am window. THAT was some racing! My last stint around 9:30 am was amazing. Little traffic and warm tires had us running consistent 2:28-2:30s. This was my first time at VIR and I'm in love. T10 takes some major balls to stay off the brakes! As I write this I'm at work and still on only about 5 hrs of sleep over three days, but it was so worth it. As for that oil slick: I was braking hard going into the uphill entry of the Rollercoaster when I saw the blue Miata in front of me just go straight off into the grass. I have no idea how I did it but I identified it as oil and barely managed to stay on. No caffeine was needed at this race! You were sleeping, I was about 5 cars back from the Valdez, just never said anything about it on radio. The moment you've been waiting for—CTM vs bird. May I share the video? I watching the bird circle that area and start his final approach was"WTF this won't end well" to all our guys in the pits just before the hit. Another few cars right afterwards made good the feathers fly. First goose I have seen get hit on track. Sorry about the window net. We are an inexperienced team. This was our second race and the first for my crew chief. We had a great time made the whole race with no issues other than the car being very slow. We considered it a victory to have stared 96th and finish 40th and 3rd in class. Had some good races with the RX7 pitted next to us and a few othe cars on track. Most of the time we spent waving people by and staying out of the way. I know there is a channel you guys have for suggestions to the rules, but I am going to mention it here the max 4 lights rule needs tweaked. We didn’t do enough research before adding lights to our car and decided to run 4 cubes on the hood plus the cars headlights and fog lights. The amount of light those would have put out was nothing compared to what other people had. A 24 inch light bar and a cube both count as one light?🤨. Maybe for LED lights switch to a total length rule like no more than X inches of LEDs? Thanks to all the workers and organizers as I said this was our second race, first was Charlotte, both times only ever meet completely nice helpful people. This is a great organization and one we will be involved with for a long time. 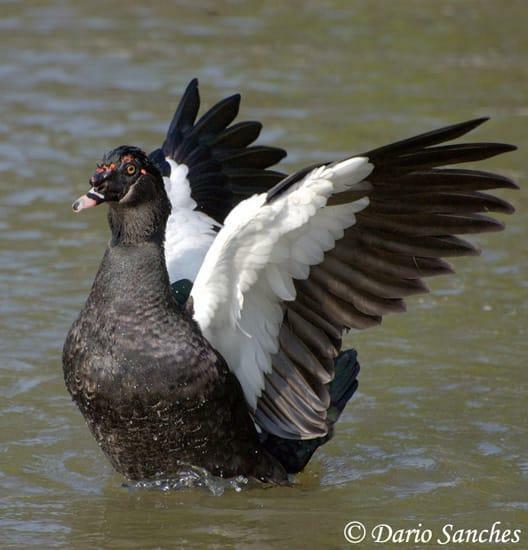 We have identified the bird as a Muscovy Duck. No formal information will be released until the next of kin has been notified. First of all, thank you to all of the organizers/volunteers that made this AWESOME event possible! Our whole team had a blast facing both triumph and adversity over and over again. We had just a minor little issue at the 4hr 18min mark, where our little red Miata lost a LR caliper and ejected the brake pads at 115 MPH. (I could actually see them sliding across the track in my mirror!) The pedal went to the floor and I drove off the end of the backstraight so far I needed a map to find my way back to the track. We didn't run a camera, but I was wondering if any cars behind us happened to catch that mess on video? Congrats to all finishers! Wow. That's one flock of geese that's going to be making the trip south this winter in missing-man-formation. Bless his little avian heart. Officials are looking into this matter, but no note or letter has been found. A preliminary investigation reveals no family problems or work related issues either, nor has any group claimed to be the perpetrators of this dastardly attack on an unsuspecting BMW. 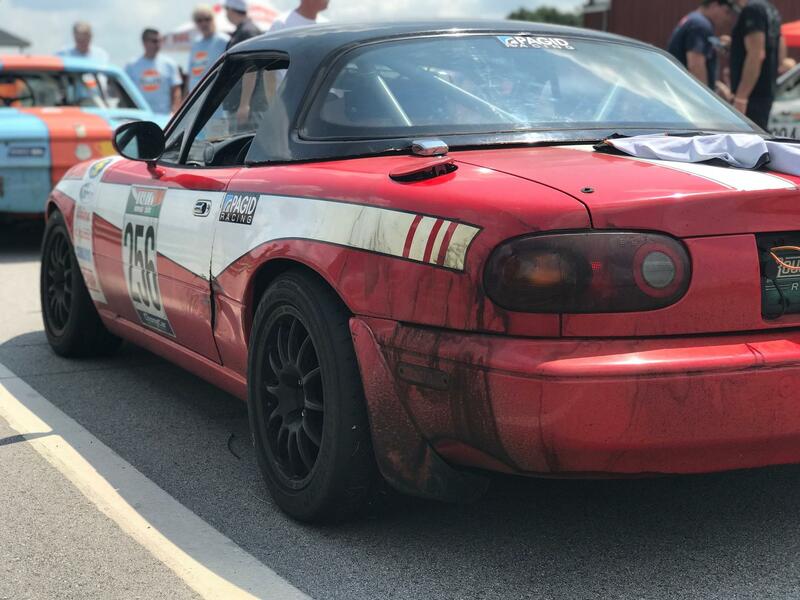 Several Miata teams have been questioned, but all claim no knowledge of the incident. At this point, ChampCar officials believe it to be an isolated "racing incident". The team was not black flagged for the incident as the video clearly shows the BMW was not at fault. Well aren't you guys just being all peachy. Yeah made it to Mississippi about 8 this morning just in time to go on to work. If any of y'all have not been around this Huggins racing bunch, the entire team is not only fun to race with but just great to be around. Great family atmosphere, I admire what y'all have there. It was a privilege to be asked to come be a part of it. Not much time to reflect, apparently I have a serious racing addiction as we run my car this weekend in the "other" series. Two nights to get it ready to load up and head that way. Happy trails everybody. You were not the only ones to have window net issues. It was fun to hear reactions when we asked “Is there anything missing between you and I?” Most involved some sort of expletitive. We helped each one with a smile. 2:28? You do realize if you had been driving faster you would have been past the poor defenseless bird before he made his ill fated pass through the start finish line. Seems a little far north for a Muscovy duck. I know, I was embarassed to post it. I've got a lot of excuses but I'm not sure which one to use. I'll post a "better" lap later, it had a sub-20 in it but the endurance mentality had taken hold. Does the post include an Opel GT? If not, then you have nothing to be embarrassed about. I demand Champ hire a full time ornithologist to manage bird/ car relations. My race was the tale of two heart breaks. I started the race in the Not Banned Yet #307. 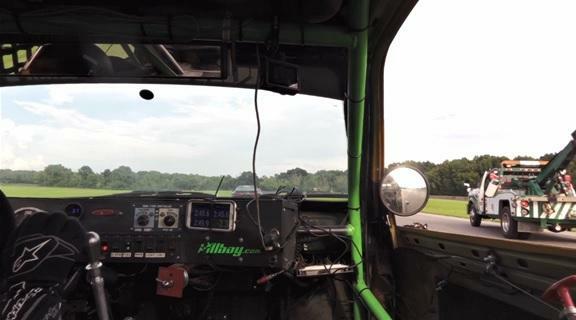 I cut through the field in the first hour or so and was cruising around doing what I consider an easy pace on the car. No curbing, shifting gently, easy on the brakes. Etc. We still turned the FTD with a 2:13.8, just a tenth faster than my FTD from last year in the Huggy #146. I got out with the car in 1st and handed it to Justin of JAS. We continued on for a few more stints before our alternator started to fail. We ended up changing it and losing 5 laps. A challenge I was looking forward to since the boss gave me the go ahead to go for the extra mustard. Unfortunately, the fuel rail literally cracked before I got back in. Right snack dab in the middle of a solid piece of steel. Our only known spare was back in Richmond, a 6 hour round trip. We called it quits, happy the car wasn't extra crispy with a side of marshmallows. Next morning the guys at Leviathan Motorsports asked me to drive their car. I was down in the pits talking to them about doing so when suddenly, 30 minutes ahead of schedule the driver came in complaining of engine overheating. "Well Wyatt, it looks like it's time to suit up!" So I sprinted back to my trailer, threw on my suit and sprinted back to hop in. They checked the car over and cleaned the debris off of the radiator causing the issue. I went out with the instructions to "Bring it home but see what she can do!" I rejoin the track to hear a horrible grinding noise. Thinking, "What a great way to start a relationship with a new team... nothing like making them fix something..."
I pull back in, to find I had retrieved a whole splitter, mounting hardware and all. The team was actually kind of excited. #FindersKeepers. They plan on reusing some of it so I contributed to the national recycling movement! After they unwedge the splitter from the other car I continue on. I must say that overall their MR2 was very pleasant to drive, I was comfortable and enjoyed the ergonomics even at 6 feet tall. Well, after a few laps of me cruising and eyeing the water temp gauge, I detect a loss of power and the temp gauge starts to creep up. I throw it in 5th gear and creep back into the pits. The water temp continually creeping up. I come to a stop in the pit to hear a literal squeaking from one of the cylinders. My educated guess says that the engine ran low on coolant while the previous driver ran a few laps with debris blocking the radiator. The temp gauge never really moving for me as there wasn't much fluid in the car to pass by the sensor anyway. So inevitably they had to retire as well. Just an hour and 45 minutes from the end. Thanks to Ballenger Motorsports and Leviathan Motorsports for inviting me to drive! I look forward to running with you guys in the future! ^^^^^^. Ballenger- he’s not kidding. He really did drive sedately that first stint. When your car caught me and slowly got by, I thought “I wonder who is in the car - can’t be Wyatt”. At the very end of the stint you lapped me and I thought MAYBE it was Wyatt that time. I think I even passed him back at one point when traffic snared him a bit. I always figured that the only way I’d ever get to pass @Wyatt would be under yellow!